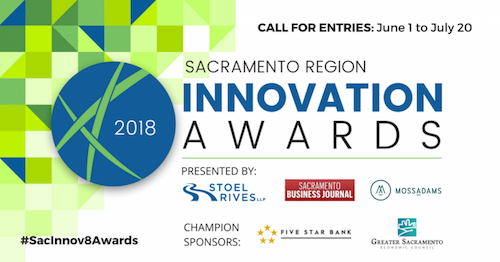 The 3rd Annual Sacramento Region Innovation Awards will recognize the area’s vibrant innovation community — from startups to established companies — and their breakthrough creations. Manufacturers can apply themselves or submit a nomination up to July 20. Eligible entries will undergo a strict evaluation process by peers and leaders from the Capital Region’s business, civic and academic communities. Pioneering innovations will be judged on market need, economic impact, disruption and novelty. You can apply and see eligibility requirements at www.sacramentoinnovationawards.com/submissions. In celebrating regional innovation, the awards aim to strengthen the Sacramento story, build the local economy, and stimulate the creative minds fueling our innovation ecosystem. Founded in 2016 by business law firm Stoel Rives LLP, the program is made possible with support from CMTA Associate member Moss Adams LLP, the Sacramento Business Journal, Five Star Bank, and the Greater Sacramento Economic Council — not to mention dozens of community partner organizations and the esteemed Selection Committee. Join the effort — nominate or apply before July 20!